Home >> Filtration Cartridges, Inline Filters & RO Membranes >> Deionization Filters >> Water Deionization Filter Cartridge 2.5"x10"
Water Deionization Filter Cartridge 2.5"x10"
The De-Ionization (DI) Cartridge contains the highest grade Gel PolyStyrene Crosslinked with DVB resin. This mixed bed (cation and anion) moist spherical bead deionization resin is ideal for ultra-pure water applications (medical, dental, aquarium, etc.). 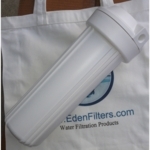 This filter is normally used after a reverse osmosis membrane to reduce minerals in water and produce ultra-pure water with almost 0 TDS or conductivity values of 0.1 us/cm. 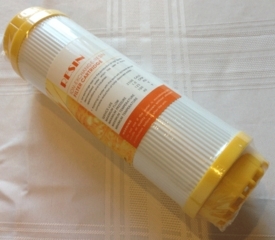 In the housing, there are polypropylene pre- and post-filters to reduce the possibility of water bypassing the resin. The cartridge has a capacity of 250 grains (or 2500 gallons post Reverse Osmosis), an initial pressure drop of 1.5 psi at a flow rate of 0.5 gpm. This 2.75�x9.875� cartridge fits in the standard 10" housing. This DI Cartridge goes in Stage 5 housing of the RO/DI Water System (RO5-25-DI). It is recommended to buy TDS meter to monitor TDS in water to determine when the media is exhausted and replacement is needed.